An object that is gold in one specific area but becomes worthless if you leave that area? Let us pretend there is some "sacred city" created by gods, where gold is so common that it is the standard form of currency and everyone has lots of it. But once you try to leave the city with this gold and move somewhere poorer, the gold will turn to dull rocks or dust. The ideas I've had so far is that perhaps the gold is more a pseudo-gold, and is actually a reaction to some sort of electrical or magnetic field from a crystal within or around the city. Perhaps radiation of some kind. But surely this would also have other side-benefits like radiation poisoning? Are there any other rational explanations as to how this could work? I'm looking for mostly-scientific answers and not just "it's magic" sort of answers. Broadly speaking, any time an economy moves beyond bartering of goods (my wheat for some cloth etc...) and into a money system, that system can only work because of a mutual trust and shared agreement on the value of that money. We are so used to this mindset it is hard to escape; we think of gold, gems and other 'obvious' currencies for a fictional world as having inherent value as tokens of worth. If you absolutely need a physical object which degrades outside the city via science, then best bet are small money tokens that appear to be glowing rocks. The glow is in fact the result of microelectronics where an internal wireless receiver in the rock gets energy from the precisely-tuned EM field that permeates the city, and that receiver powers a light source (different colours for different 'coin' values?). Let us assume that all the circuitry is incredibly fine, and essentially invisible to the human eye, even if the rock-tokens are split open. As in the banknote answer, these glowing tokens are an agreed upon money system in the God's city, backed by a banking system. Unlike in the banknote answer, glowing rocks look amazing and clearly are worth stealing to be sold elsewhere for a lot of money. However, removed from the EM field in the city, these tokens would stop glowing and appear to just be meaningless pebbles. Thus become worthless to the uninformed observer. Further interesting lines of exploration would be Gods out in the world with battery-powered units that can make the coins glow, and thus the Gods can trade successfully (and in secret) with their currency outside of their main city. [added in edit] This is hard. I don't know if there is any actual method to do this. But first we'll define the problem: reflectance & weight. suspend tiny particles with a characteristic lengthscale & spacing in a resin such that you engineer the approximate reflectance, then have an environment that destroys the resin outside of the city, leaving behind non-golden dust and liquid (sonic resonance? a large magnetic field that yanks or inductively heats the particles?). Unfortunately, suspensions in resin are unlikely to have the bright sheen of a real metal's surface. Use a metamaterial of variable reflectance that is activated by electric fields (or an applied voltage difference from circuitry) in the same way as the glowing pebbles are in my second answer. Such materials are barely in early testing (Some Graphene research). I don't know how well such metamaterials could plausibly be engineered to look like gold, but it might pass a sci-fi sniff test. As we can see, these "golds" are not easy to back with hard science, but they might pass muster in a story with sufficient handwaving. Options 1 & 2 are scientifically stronger and can meet story requirements unless gold is specifically needed. Your wealth is kept in your house garden. You carry it crawling about your person. 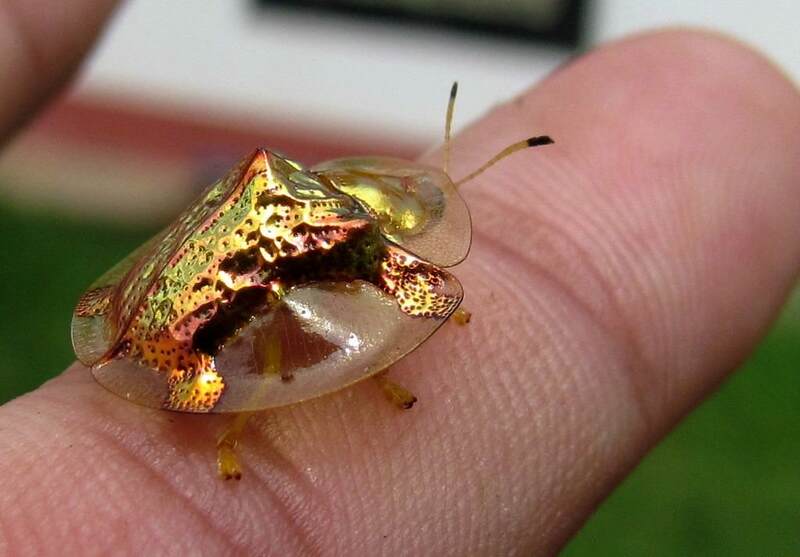 In the city, these golden beetles thrive - blessed by the well watered plantings, careful citizenry and possibly the gods. First off, set your city of the gods underground. Secondly, replace your gold with sparkling jewels the like of which no mortal has seen! The trick is that the city is dimly lit artificially with high UV content light. The currency gems are highly phosphorescent under these low light, high UV conditions but when taken back the surface appear dull and indistinguishable from normal pebbles. The city is under the influence of an entity that controls the minds of the inhabitants and makes them think that rocks and dust are actually gold coins. But the inhabitants can't tell the difference between them leaving the influence of the mind control and the gold just turning into rocks and dust. The inhabitants think that they are wealthy, but they really are not, they're just suffering from a combined delusion. Prices skyrocket in the city and they can't buy food with the gold because the traders won't accept their gold as payment because they know that they can't take the gold home with them. Eventually the inhabitants realize that their gold is worthless and that they are as poor as other cities, and they treat gold the same way that they do rocks (worthless), but they appreciate the beauty of their gold rocks. They focus on becoming really wealthy by producing goods that they can actually use like food, clothing, and livestock, instead of focusing on shiny metal that has no practical use. A barter economy develops instead of a currency economy. This city is on a high mountaintop where temperatures never exceed 20 c. However, the mountain is surrounded on all sides by a sweltering desert where daytime temperatures often exceed 35 c. The currency is made of gallium, a metal that melts at about 30 c. The coins always remain solid at the temperatures within the city, but will quickly melt in the surrounding area. I suggest gold plating because then the original coins would look like gold, but if they melted and re-solidified, they would look like silver or tin. Pure gallium is a blueish silver color. Now, you don't want magic, but there needs to be some handwaving✝ involved because alchemists have been trying to figure out how to transmute lead into gold for thousands of years and they haven't figured it out yet. Therefore, there's not a lot of science that can justify the transmutation. But... notice that lead and gold have the same basic core: [Xe] 4f14 5d10. The only difference✢ is three electrons, one in the 6s shell and two in the 6p shell. Let's put that seemingly small§ difference to work. A local magnetic field with an unusual perturbation (call it a "vibration") naturally strips lead¶ of those three extra electrons, making it gold far more common than it should be and lead far less common than it should be. But, when you leave the area of the magnetic field, nature trys to reassert itself — a bunch of electrons bind to a bunch of the gold in your backpack, creating lead, very little weight change, so you wouldn't even notice it. This would have the side affect of there being a circular region around the outer edge of the magnetic field that had an unusually high electron count. The area would have a higher than normal electric charge and would likely result in terrible lightning storms surrounding the city — making it harder to enter and exit. ✢ That we care about for the purpose of this question. § When I say small, what I really mean is, "it's a big deal on the order of needing a dedicated electrical plant and a particle accelerator to actually make this happen." But we're handwaving. See the pretty girl over there? Yeah. Keep your eyes on her. Pay no attention to the dude behind the curtain. ¶ And ONLY lead. This gets really ugly if the field can strip three electrons from almost anything. Like, "Help, help, I can't breathe!" and "Oh, crap! I'm dissolving!" ugly. So that perturbation is very, very specific. 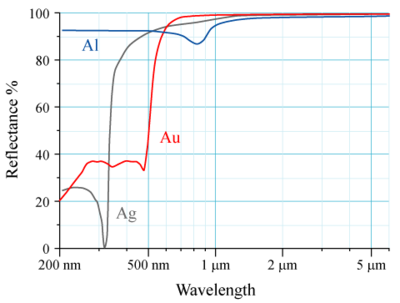 The "gold" is actually an active metamaterial or nanomaterial. The gold colour is produced not through the usual process, but because of nano-scale etching on its surface. This nanoscale structure exists throughout the material. It is actually made (mostly) out of lead. The material listens for a radio broadcast. When it fails to recieve it, a reaction starts which breaks down the nanoscale structures and the metal converts to dull lead. In effect, we have lead wrapped in a hologram of gold that, when cut, the cut surface also has the hologram gold on the surface. Not quite as insane as grey-goo nanomachines, but crazy high tech still. This isn't mine, but if you read the book "The Wizard of Oz", when they go into the Emerald City they have to wear special green colored glasses, because everything is so bright inside that they would be blinded by the beauty and light. Most of the Emerald City seemed to run on chicanery and there is the vague impression that the green wasn't real. A similar mechanism could be in place to make lead seem like gold. Actually, gold is precious because it is rare. It does in real life have properties that are useful (heavy, malleable, conductive) but most of its value is simply in rarity. If it was everywhere in your city, it would therefore be not worth anything at all. For instance, wood is quite a common resource, as it is everywhere we use it for many things, and it's worth is comparatively less. If wood was extraordinarily rare, and hard to get, we would value it just as much as gold. So for your scenario, perhaps in the city it is very rare (and precious as is the case in real life) and as soon as you walk out of the city you notice it lying on the ground everywhere, and suddenly it would be worth just as much as your "dull rocks or dust". In keeping with your story though, perhaps everyone is deceived, and the gold they thought they had was in fact Fools Gold, which is commonly found in coal. Having believed this is the genuine article, upon leaving the city they realise it was all an illusion and that they were deceived by the 'Gods' all along. So I am no chemist, but this is a tough one. Gold is...well gold. You honestly could not have chosen something that humans traditionally value that is more difficult in this scenario. But that does not mean there isn't an answer. Buuuuuut...there is one interesting tidbit that led me to write this answer. except aqua regia (a mixture of hydrochloric acid and nitric acid) which can dissolve gold. Aqua Regia. A good name, roughly translates from Latin as: "royal water" or "king's water"
Your sacred city rises from the surrounding plains, the evening sunlight making the gold domes bathe the surrounding landscape in in soft glowing light. There is only one way into the city, a pathway of white marble leads across the landscape disappearing into the base of the mountain. All are welcomed and as they pass through the caves into the city of the gods they are given what money they need and new clothing, since medieval folks...you know...smell bad. (I am not going into the economics of this, others have covered it, but the gods run the city so...its probably fine). When the mortal's business is concluded, or when their allotted time to spend in the city expires the must walk "the pilgrim's path" (whatever you want to call it). While on this path they must walk this spiritual path and be stripped of the goods of heaven. Along this path are the holy waters (its a misnomer). All goods from the sacred city must pass through these waters before they can enter the mortal world. The waters are of course... aqua regia and as they place all their possessions from their time in the city they dissolve before their (probably watering) eyes. Check out the wikipedia link...it literally creates dust from gold. Interestingly there are probably some things you could take out of the city through the waters...but I have no idea what that would be. Everyone who's anyone in the city has an active credit card that identifies that person. Like our modern financial system, the card doesn't actually store the balance, only the identifying information to link the card with the account it accesses. The financial system is inaccessible outside the city. Furthermore, the regulated entry and exit points have fields that will immediately deactivate any cards passing through, so anyone entering the city or exiting the city through one of these regulated entry or exit points may have a card, but the card has been wiped clean. If you leave the city, don't take your card with you or it will be rendered useless. As a housekeeping measure, the financial system tracks activity on various accounts. If no activity, so much as a balance query, takes place within a certain period of time, the funds in that account will be marked as unclaimed. It doesn't have the visual or tangible appeal of gold, but the concept is readily explained. The gold is an unstable isotope, perhaps gold-198 or so (which decays to mercury), with halflife of at least hours or days. Within the realm of the gods' sacred city, there is some phenomenon preventing (or greatly slowing) radiactive decay. You'll need to handwave exactly what this is, but being that you have gods at all, perhaps that's reasonable. Gold that "melts" into a toxic and difficut-to-handle substance when you take it out of the city sounds like exactly what you want for narrative purposes. Does it have to be gold, or as other contributors have mentioned a different form of currency? If I am understanding the question correctly, you are looking for something that changes state or form when it leaves an area. Or something that maintains a stable state within the city and collapses outside of it. My suggestion would be glass. The Sacred city is surrounded by a wall or barrier of sound. The currency of the city of gods are hollow glass orbs, and when you pass through the barrier, the glass orbs shatter much like a wine-glass might shatter at a specific frequency. Now, if any of the poorer area's know how to mold glass, then they could also manufacture these glass bulbs as well so it would depend on the technology outside of the god city. Gallium is a rather rare metal, great for making shiny coins, but its melting point is about 30°C (85°F). Therefore, coins made of it keep their value while in the sacred lands of Scandinavia or Canada, but when moved to the sinful lands of the Mediterranean or the Sun Belt they just melt in Summer to astonishment of the wicked who dared to take them out of the holy lands. As a quasar, TON 618 is believed to be an accretion disc of intensely hot gas swirling around a giant black hole in the centre of a galaxy (...) The surrounding galaxy is not visible from Earth, because the quasar itself outshines it. With an absolute magnitude of −30.7, it shines with a luminosity of 4×1040 watts, or as brilliantly as 140 trillion Suns, making it one of the brightest objects in the Universe. The only reason the city does not burn to a crisp is due to a post-singularity shield around the planet. Leave the planet, though, and the radiation from TON 618 will disassemble any gold you take with you into subatomic parts. You will be disassembled too, by the way. Maybe not gold, but perhaps the city happens to be located in a place that has a high background level of ultraviolet light. As a result, many minerals will fluoresce bright colours while in the region, but once you leave those minerals lose their fluorescence and just look like rocks. In fact, you could probably make up some kind of mineral that does indeed have a golden fluorescence. I'm not sure what would cause the area to have excessive UV light - maybe there's some unique atmospheric condition that affects the amount of sunlight? Maybe there's something similar to the hole in the ozone layer above the city, and everywhere else the UV is being perfectly filtered. Borrowing Inspiration from Eiichiro Oda. The Mystical Sky Island or Skypiea, where the inhabitants live on a dense form of cloud which is hard enough to walk on. The most valuable commodity here being regular soil. Soil being impossible to find there becomes an invaluable commodity. Not the answer you're looking for? Browse other questions tagged science-based science-fiction or ask your own question. Real “Alchemical Transmutation” of Some Other Mineral Into Gold?